τους άρχοντες που λαμπεροί ψηλά φαντάζουν. η ανδρόψυχη καρδιά που ελπίζει της γυναίκας. με τον καλύτερο δεν κυβερνιέται τρόπο. Το γλυπτό της φωτογραφίας είναι έργο του Γιώργου Κυπρή. [ENG] I pray the gods to quit me of my toils, / To close the watch I keep, this livelong year; / For as a watch-dog lying, not at rest, / Propped on one arm, upon the palace-roof / Of Atreus' race, too long, too well I know / The starry conclave of the midnight sky, / Too well, the splendours of the firmament, / The lords of light, whose kingly aspect shows-- / What time they set or climb the sky in turn-- / The year's divisions, bringing frost or fire. / And now, as ever, am I set to mark / When shall stream up the glow of signal-flame, / The bale-fire bright, and tell its Trojan tale-- / "Troy town is taken:" such issue holds in hope / She in whose woman's breast beats heart of man. / Thus upon mine unrestful couch I lie, / Bathed with the dews of night, unvisited / By dreams--ah me!--for in the place of sleep / Stands Fear as my familiar, and repels / The soft repose that would mine eyelids seal. / And if at whiles, for the lost balm of sleep, / I medicine my soul with melody / Of trill or song--anon to tears I turn, / Wailing the woe that broods upon this home, / Not now by honour guided as of old. [Aeschyli "Agamemnon", translated by Edmund Doidge Anderson Morshead]. The sculpture in the photo is artwork of Yorgos Kypris. 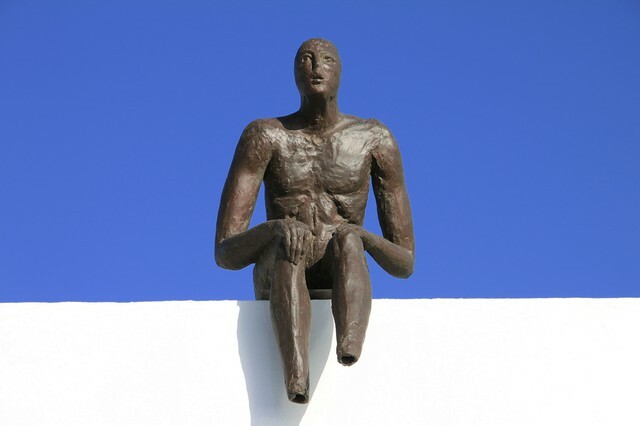 It can be seen outside his galery "Mati" in Fira of Santorini.